Endocranial surfaces, volumes, and interconnectivities of extant and fossil odontocetes potentially offer information on the general architecture of the brain and on the structure of the specialized cetacean circulatory system. Although conventional methods for acquiring such data have generally involved invasive preparation of the specimen, particularly in the case of fossils, new tomographic technologies afford nondestructive access to these internal morphologies. 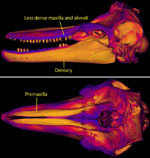 In this study we used high-resolution X-ray computed tomography (HRXCT) to scan a skull of the extant Tursiops truncatus (Cetacea: Odontoceti). We processed the data to reveal the cranial endocast and details of internal skeletal architecture (data at www.digimorph.org). Major features that can be discerned include aspects of the specimen's hypertrophied retia mirabilia, the major canals and openings of the cranial cavity, and the relationship of the brain and endocranial circulatory structures to the surrounding skeleton (see Additional Imagery). CT data also provide information on the shape of the brain that may be lost in conventional anatomical preparations, and readily provide volumetric and linear measurements of the endocast and its individual segments. These results demonstrate the utility of HRXCT for interpreting the internal cranial anatomy of both extant and fossil cetaceans. Expert annotations for this species! See the InspeCTor. Tursiops truncatus (the bottlenose dolphin) has a worldwide distribution, ranging from the Mediterranean Sea to the Atlantic and Pacific Oceans. This wide-ranging distribution, together with high levels of polymorphism and clinal variation, have made the taxonomic status of Tursiops difficult to resolve. 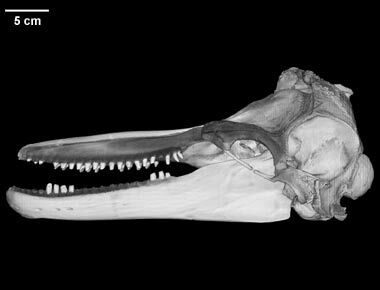 The specimen we scanned was identified Tursiops gilli, which is here considered to be a synonym of Tursiops truncatus (following Hansen, 1990, and Wells and Scott, 1999). SDSNH 21212 is a fine example of the 'coastal form' of the bottlenose dolphin - a variety of the species which may eventually be accorded sub-specific status (James Mead, personal communication). Tursiops truncatus is an odontocete cetacean. Cetacea includes all the living and fossil whales, and odontocetes are the toothed whales, which in addition to ocean dolphins such as Tursiops, also includes river dolphins, porpoises, orcas, sperm whales, beaked whales, belugas, and narwhals. The other group of extant whales are the baleen whales, or Mysticeti, which are characterized by plates of baleen that hang from their upper jaws. Baleen is used to strain planktonic food sources from the water. As a consequence of their completely aquatic lifestyle, whale skulls show many evolutionary modifications that are readily apparent in the CT data. Some of these modifications are discussed below, including: ‘telescoping’, asymmetry, and unusual patterns of bone deposition. The skull of odontocetes is 'telescoped', a condition referring to the posterior displacement of the facial bones relative to the braincase that has occurred during the course of their evolution (see illustration to the left). 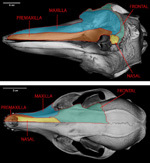 Cetacean telescoping appears to be an architectural consequence of the dorso-posterior positioning of the nasal opening on the skull, which allows these fully aquatic mammals to more easily breathe while swimming. Because the basic arrangement of bones involved in telescoping is different in the mysticete and odontocete whales, it appears that this unusual morphology evolved independently in these two groups and is an example of evolutionary convergence. To see CT data illustrating telecoping, use the inspeCTor, the java slice viewer available above, to access labeled images of every 10th slice along three orthogonal axes of the skull. 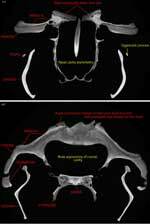 Other examples of cranial telescoping in mammals on the DigiMorph site are the lowland tapir and Baird's tapir. In contrast to the aquatic adaptations responsible for the condition seen in whales, the telescoping of tapir skulls is related to their evolution of a prehensile trunk. Most odontocetes (but not mysticetes) have asymmetrical skulls and faces. The distribution and degree of asymmetry varies interspecifically and intraspecifically among odontocetes, being less pronounced in the more basally diverging species and nonexistent in some early whales (Berta & Sumich 1999). The asymmetry always occurs such that structures on the right side of the facial region are larger than those on the left (Berta & Sumich 1999). CT data of Tursiops illustrates this characteristic asymmetry . Although it has been suggested that cranial asymmetry evolved only once within Odontocetes (Heyning 1989), another hypothesis suggests that it may have been independently acquired in at least two, and maybe four, odontocete lineages (Milinkovitch 1995), having first started as facial asymmetry in the ancestor of all whales. Further study of patterns of asymmetry in fossil and Recent cetaceans is needed to evaluate these different scenarios. Unusual patterns of bone density. Portions of the mandibles and premaxillae are made up of extremely dense bone, having a density approaching that of the teeth. This is reflected by the light gray colors of these elements in the CT data (in CT data, differences in bone density correspond to different values of gray in the images - with lighter gray values representing denser objects). Studies have shown that the lower-jaw bones are sensitive to sound and are likely used in sound-reception and echolocation (Berta & Sumich 1999). Macleod (2002) reviewed several possible functions for the dense rostrum of the Blainville’s beaked whale (including prevention of damage during male-male combat, a ballast to aid in deep-diving, and sound transmission and reception), but concluded that it most likely serves as a defensive and/or offensive shield in the aggressive exchanges observed between males. However, it is certainly possible that there is more than one function for this unusual pattern of bone deposition. This specimen (SDSNH 21212) was collected at La Jolla Shores, San Diego County, California, in October 1957, by R.M. Gilmore. Many teeth were no longer in their alveoli when scanned, and it is possible that some of the teeth were not placed in their appropriate alveoli in these scans. The left zygomatic is broken at the junction between the squamosal and jugal. The degree of wear on the teeth and fusion of the bones of the braincase indicate the specimen's maturity. SDSNH 21212 shows abnormal osteological growth that is most noticeable on the right supraoccipital and ventral margins of the basioccipital crests. The following images show SDSNH 21212 as it appeared prior to scanning. Left side of the skull. Right side view of skull. About the labeled slices available in the "inspeCTor" slice viewer applet. Annotated slices labeling the osteology observed in SDSNH 21212 are available for every 10th slice along all three orthogonal axes of the skull. These can be seen using the inspeCTor java slice viewer applet. In these annotated slices, bones are labeled in red; processes, structures, cavities are yellow; and teeth are labeled in white. Rommel (1990) served as the primary reference for the osteology of Tursiops. As noted above, this is a relatively mature individual, and many of the sutures between skeletal elements are completely fused. Accordingly, labeled terms for the various occipital elements (e.g., basioccipital, exoccipitals, and supraoccipital), and for the sphenoidal and ethmoidal elements, are inferred based on their general location. Similarly, the parietals, which are completely fused to the occipital complex, are considered to lie in a location ventral to the temporal crest. In many ways, whales have the most aberrant skulls of any mammals, a consequence of their many adaptations for fully aquatic existence. This, in conjunction with the extreme individual variation common in cetaceans, has led to confusion in the literature as to the appropriate designations for many osteological features. The labels presented here are a preliminary effort to begin interpreting the skull of Tursiops based on CT data. It is hoped this contribution will help to guide future research efforts to sort out issues of nomenclature and homology. It is also clear that there may well be errors in our labeled slices, or anatomical names that are preferred on the basis of different interpretations of homology. If you notice an inappropriate label, or have any suggestions, please contact Matt Colbert - we appreciate your feedback! Click on the labeled image at left to see the quality of the unreduced imagery. Labeled slices for every 10th slice along all three axes can be accessed from the inspeCTor java slice viewer applet available above. The specimen was made available to Timothy Rowe, Matthew Colbert, and Rachel Racicot of the Department of Geological Sciences, The University of Texas at Austin for scanning (courtesy of Tom Deméré of the San Diego Natural History Museum). The specimen was scanned by Matthew Colbert and Richard Ketcham in June 2002 along the coronal axis for a total of 628 slices, each slice 1 mm thick, with an interslice spacing of 0.9 mm. During the course of the scan there was an unexpected crash of the computer system. Unfortunately, this caused the specimen to shift and rotate as its mount brushed up against the detectors during recalibration. Several images were corrupted, and had to be reacquired; all other images had to be ‘nudged’ and rotated in Photoshop to account for their changed position relative to those gathered before the crash. The corrupted, and subsequently reacquired images were coronal slices 320-321, 533-534, and 621-628. Note that it was impossible to reacquire these images at the precise level of the original series, and that this introduces artifact into both sagittal and horizontal resliced images, as well as the 3-D renderings of the skull. Note as well that it was not possible to reposition the lower jaws with the skull on the reaquired images, and accordingly the mandibles are missing on slices 320-321. The following image processing was done to the initial scan data. Slices 322-532 were rotated 3.2o clockwise relative to slices 1-319, and nudged four pixels up. Slices 535-620 were rotated 20.0o clockwise relative to slices 1-319, and nudged up 18 pixels. As noted above, slices 320-321, 533-534, and 621-628 were corrupted and reacquired at a later point. These images were nudged, rotated, and had their levels adjusted to approximate those of the original scanned slices. We would like to thank Timothy Rowe for paying for these scans and for his helpful advice regarding the labeled images. Several people also provided constructive criticism, including: James Mead (Smithsonian Institution), Ewan Fordyce (University of Otago), Mark Uhen (Cranbrook Institute of Science), Julian Humphries (DigiMorph staff), Annalisa Berta (San Diego State University), and Ted Cranford (San Diego State University). Thanks as well to Tom Deméré and Kesler Randall of the San Diego Natural History Museum for selecting this specimen and shipping it to us. Anderson, H. T. 1969. The Biology of Marine Mammals. New York: Academic Press. Berta, A., and J. Sumich. 1999. Marine Mammals Evolutionary Biology. San Diego: Academic Press. Carroll, R. 1988. Vertebrate Paleontology and Evolution. New York: W.H. Freeman & Company. Colbert, M., Racicot, R. and T. Rowe. 2005. 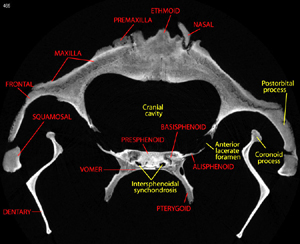 Anatomy of the cranial endocast of the bottlenose dolphin Tursiops truncatus, based on HRXCT. Journal of Mammalian Evolution 12:195-207. Fordyce, E. and C. de Muizon 2001. Evolutionary history of the cetaceans: a review. in Secondary Adaptations of Tetrapods to Life in Water. Mazin, J.-M., and V. de Bufrenil, eds. Verlag Dr. Friedrich Pfeil, Munich, Germany. 169-223. Harrison, R.J. 1972. Functional Anatomy of Marine Mammals. New York: Academic Press. MacLeod, C. 2002. Possible functions of the ultradense bone in the rostrum of Blainville’s beaked whale (Mesoplodon densirostris). Canadian Journal of Zoology. 80: 178-184. Marino, L., M. Uhen, B. Frohlich, D. Bohaska, J. Aldag, and F. Whitmore. 2000. Endocranial volume of Mid-Late Eocene archaeocetes (Order: Cetacea) revealed by computed tomography: implications for cetacean brain evolution. Journal of Mammalian Evolution 7: 81-94. Mchedlidze G.A. 1984. General Features of the	Paleobiological Evolution of Cetacea. New Delhi: Oxonian Press. Translated for Smithsonian Institution Libraries by R. Chakravarthy. Miller, G.S. 1923. The telescoping of the cetacean skull. Washington: Smithsonian Miscellaneous Collections 76: 1-67. Muizon, C. 2001. Walking with whales. Nature 413: 259-260. Reynolds, J. and S. Rommel. 1999. Biology of Marine Mammals. Washington: Smithsonian Institution Press. Reynolds J., R. Wells, and S. Eide. 2000. The Bottlenose Dolphin: Biology and Conservation. Gainesville: University Press of Florida. Rommel, S. 1990. Osteology of the bottlenose dolphin. in The Bottlenose Dolphin. Leatherwood, S. and Reeves, R., eds. San Diego: Academic Press. 29-49. Shimamura, M., H. Yasue, K. Ohshima, H. Abe, H. Kato, T. Kishiro, M. Goto, I. Munechika, and N. Okada. 1997. Molecular evidence from retroposons that whales form a clade with even-toed ungulates. Nature 388: 666-670. Spoor, F., S. Bajpai, S. Hussain, K. Kumar, and J. Thewissen. 2002. Vestibular evidence for evolution of aquatic behaviour in early cetaceans. Nature 417: 163-166. Thewissen, J., E. Williams, L. Roe, and S. Hussain. 2001. Skeletons of terrestrial cetaceans and the relationship of whales to artiodactyls. Nature 413: 277-281. Wells, R. and M. Scott. 1999. Bottlenose dolphin Tursiops truncatus (Montagu, 1821). in Handbook of Marine Mammals Volume 6: The Second Book of Dolphins and the Porpoises. S. Ridgway and Sir R. Harrison, eds. San Diego: Academic Press. 137-182. Click on the thumbnail to the left for an animation (1.4 mb) of the Tursiops skull with patterns of bone density indicated by color. More dense bone is represented by yellow colors, and less dense bone is represented by blues. To cite this page: Dr. Rachel Racicot, Dr. Matthew Colbert, 2002, "Tursiops truncatus" (On-line), Digital Morphology. Accessed April 25, 2019 at http://digimorph.org/specimens/Tursiops_truncatus/.